So we’ve got our data set, we’ve had a cursory investigation and now we’re ready to see if we can find anything interesting. I’m going to proceed in a fairly methodical way and be precise in the way I do things – let’s do this scientific like. 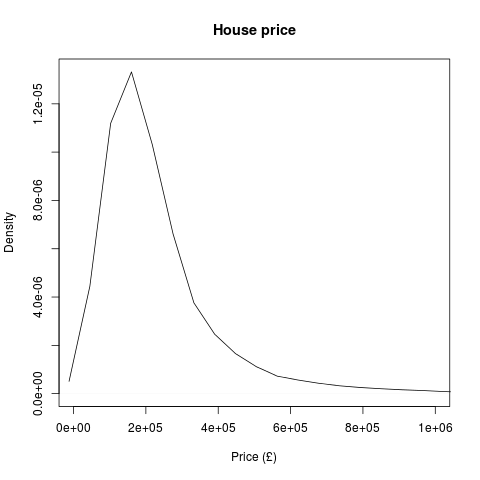 So let’s start with a null hypothesis: “The month alone has no impact on the average selling price of houses“. At this point, I don’t really know whether or not that’s true but it seems likely that it’s not. I can imagine that the housing market is, to some extent, cyclical. The first thing I’ll do is plot the data – there are a number of reasons why this is a good idea and I’d advise plotting your data wherever possible as a first step. I’ll run this example investigation in R – it’s great for exploratory analysis and it allows me to produce graphics that I can share really easily. # It's nice to have a look at the data before we perform our test on it, just to get an idea of how it looks and to check we think what we've done up to this point is reasonable. O.K – I don’t know about you but looking at the graph I’d say it looks like there might be something to the theory that the month is important in house sales. In this year, we can see a dip in the early months and then a peak when we get to summer. However, fear not. The t-test is still a good choice of test under violations of normality, especially so when there are lots of data points (we’ve got over 700,000) . As a little check, let’s also have a go at comparing the medians of the test groups. To do this we can use the Mann-Whitney U test and its multivariate brother, the Kruskal-Willis test. These are non-parametric tests (don’t require normally distributed data) and so if these say the medians of the groups are significantly different and the one-way ANOVA has shown the means of the groups are significantly different, we can be fairly confident they are! There’s an awful lot of that that we’re not interested in – the key bits for us to pick out are the p-values on the ANOVA and the Kruskal-Wallis tests – both of which are < 2e-16. We can fairly conclusively say that there are statistically significant differences between the mean and median of the average house prices by month. However, let’s have a think what assumptions we’re making and whether we’re comfortable making them. Firstly, a previous investigation has hinted that the region the house is in makes a difference to the sale price. 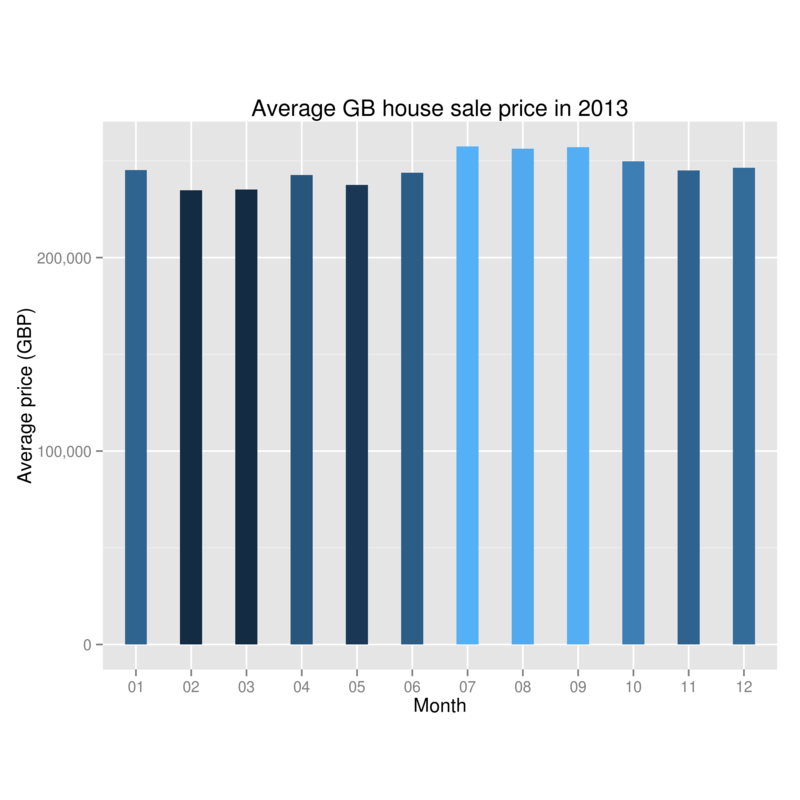 This could impact our data in any number of ways – it could be that each region sells their houses at different times and as average house value per region is different then the average house value per month ends up being different. Obviously, region isn’t the only concern – I singled that out as I’ve previously looked at it and know it’s a contributing factor to house price. Additionally, we’re only looking in one year. That means that any overall change in house prices (ala the property market crash) will completely throw our results off and give us the (possibly false) impression of a cyclical housing market. There’s an awful lot more we’ll have to consider if we’re to answer our question satisfactorily: does the month impact the selling price of a house? In the next post in this series I’ll be looking at ways of unpicking dependencies (MANOVA and MANCOVA) and will likely have to do bits of the analysis in a distributed way as there’s no way the entire dataset (since 1995) is going to fit in my RAM!